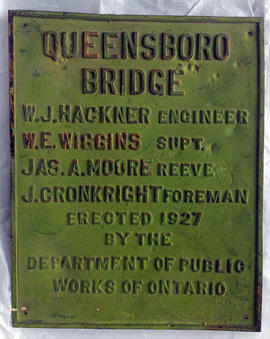 Plaque reads:"QUEENSBOROBRIDGEW.J. HACKER ENGINEERW.E. WIGGINS SUPT.JAS. 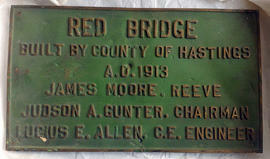 A. MOORE REEVEJ. CRONKRIGHT FOREMANERECTED 1927BY THEDEPARTMENT OF PUBLICWORKS OF ONTARIO"
4x6 Colour photographs. Downtown Madoc showing building on fire and firefighters trying to put it out. Taken in 1998, as well as other Madoc landmarks circa 2000. Black and white photographs of varying size. Taken out of a photo album. Images depict places around Madoc, Ontario. Account book including names of prize winners and lists of members.